It seems only appropriate for my first post here to reach wayyy back into the Video Junkie archives. Joe D'Amato's ANTHROPOPHAGUS 2 (a/k/a HORRIBLE; ROSSO SANGUE) is one of the first flicks I snagged back in the early 90s when I started diving into the bootleg market. How could I not? 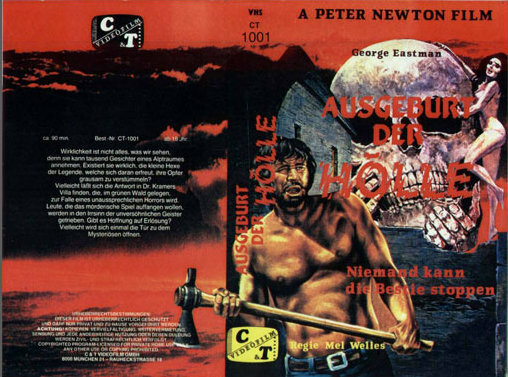 It was the "sequel" to the mighty ANTHROPOPHAGUS - a film whose posters haunted me as a child in Germany - and saw director D'Amato re-team with gut-munching lead monster George Eastman (a/k/a Luigi Montefiori). 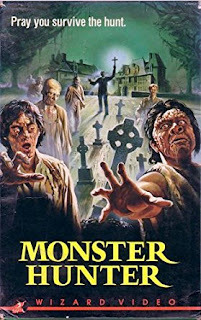 While the end result, sadly, didn't reach the levels of first film, it is still a nice slice of Euro-horror sleaze. 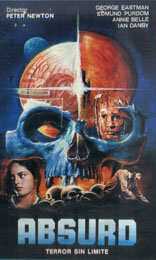 It is not truly a sequel, yet retains connections to the first film (the Greek origin; Nikos now being named Mikos). Riffing more off John Carpenter's HALLOWEEN & HALLOWEEN II, the follow-up has the titular beast popping up in a seemingly football-obsessed America and - in a plot twist that pre-dates [REC]2 by about, oh, 28 years - is being pursued by a Vatican-authorized priest (Edmund Purdom, surprisingly giving his all). Oh, did I mention the monster now has flesh regenerating powers now? That is about all the plot you get before hulking Eastman escapes a hospital and shows up at a house to harass a babysitter and her charges. Most Americans occasionally slip into an Irish accent for no apparent reason. In America, people dress up in suits and cocktail dresses for a Superbowl party. If you’ve just escaped from a Vatican-run laboratory in Greece, the best place to flee to would be America since you don’t need any ID to get into the country. When in danger from a psychotic killer, it’s best to send small children out alone into the night to get help. Even if you are a flesh-regenerating, cannibalistic, homicidal maniac, priests will totally freak you out! No medical condition is too severe to keep you down when you are being attacked by a psychotic killer. Apparently the Anthropophagus Beast needed bus fare while in Greece. Americans are never far away from multiple bottles of liquor, which they always drink neat. In America, you need to leave the real police work to the white cops. Not even a serial killer running around town is a good enough reason to drag the police higher-ups away from the big game! If you are in traction, you must lay there and do nothing except play with your compass. No music for you, even if there is a player in the room. Apparently Eastman holds a grudge against getting hit randomly by a car; wonder what the butcher and Michele Soavi did to piss him off? Italian, er, everyday USA butchers pack meat AND heat! Only George Eastman could make big white sneakers scarier than they already are. Parents will give up calling to see if their kids are okay if they see the lights go off at their house in the distance. Doctors feel guilty when they hit someone with their car but don't stop to help them. If big guys with gaping stomach wounds aren’t her type, what exactly does the nurse go for? Little guys who’ve never been scratched? If said priest is convincing enough in his story, you give him a car and gun and say, "Good luck!" That bum was totally not drunk. He was not drunk! Ha! Very true, and she was still not the worst babysitter in the movie.